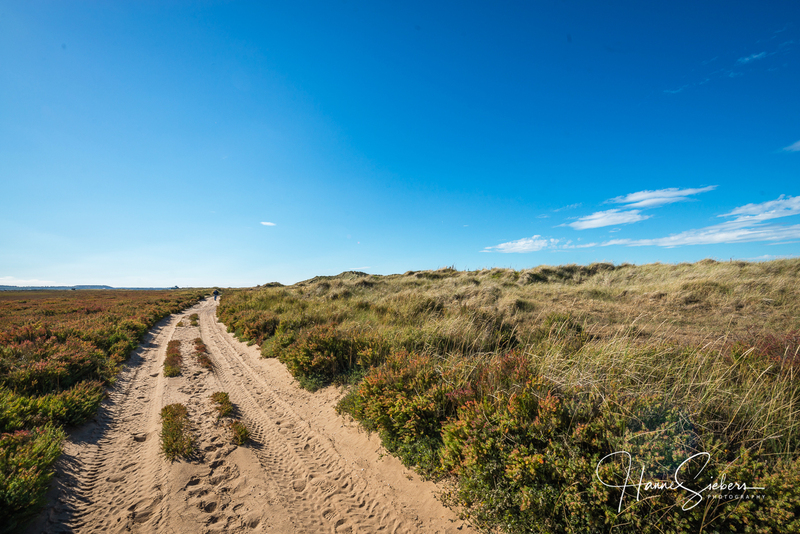 Last week we made our autumnal walk to the National Nature Reserve of the Blakeney Point which is a sandy spit stretching out into the North Sea. This about 7 m long walk from Cley beach and back can be quite strenuous, so it’s essential to plan it well. If you don’t time it right you may walk on the shingle that makes you feel that your feet are breaking off after a while. But our dear Siri 🙂 timed it perfectly well. It was like a stroll on the beach. Letzte Woche unternahmen wir unseren traditionellen Herbstausflug zum Naturschutzgebiet des Blakeney Points. Der Blakeney Point ist eine Nehrung, die sich als Sandhaken weit ins Meer vorreckt. Dieser Spaziergang von etwa 12 km kann fürchterlich anstrengend sein. Wer nicht zuvor die Tidentabelle konsultierte, dem kann es passieren, dass er lange auf Kies läuft und spätestens nach einer Stunde das Gefühl hat, dass ihm die Füsse abfallen. Unsere liebe Siri 🙂 fand jedoch den idealen Zeitpunkt, dass wir hin und zurück auf fein festen Sand geradezu am Meer entlang flanieren konnten. We love this landscape, in every season. Dina can’t wait for the winter to arrive. Then she will work there as an NT volunteer assistant warden looking after the nearly 1000 grey and common seals who are her friends already. Auf dieser Halbinsel wird Dina bald als ‘seal warden’, als Beschützerin der Seehunde, arbeiten. Immerhin leben dort z.Zt. etwa 1000 ihrer Freunde. Sie ist bereits ziemlich aufgeregt und freut sich darauf, am menschenleeren Strand zu fotografieren. We are hoping that she gives us a lift sometimes. The spit of the Blakeney Point is in a constant move since the last ice age. It grows and changes its coastline after every bigger flood. The seals don’t mind. They love the vast sandbanks and mudflats there. Wir hoffen, dass sie uns bisweilen in diese menschenferne Anderswelt mitnimmt. Die Nehrung des Blakeney Points ist seit der letzten Eiszeit in ständiger Bewegung, eine Gestaltwandlerin, die langsam wächst und nach jeder Sturmflut ihre Form verändert. Die Seehunde stört das wenig. Sie lieben diese weiten Sandbänke. At the end of this month, Dina will have her seal warden training. And do you know what? We are very envious because she’ll get one of these old Landrovers she very much likes. She will be privileged to be allowed driving down the sand and gravel track you see in the pictures below. Natürlich muss unsere liebe Dina nicht zu ihrer Arbeitsstelle laufen. Wisst ihr was? Wir sind ganz neidisch, sie bekommt nämlich einen feschen alten Landrover mit dem Privileg dort auf der Sand- unf Schotterpiste, die ihr unten seht, hinausfahren zu dürfen. She will see the overgrown saltmarshes on the land side that are loved by many birds and often birdwatchers roused rare birds here. This harmlessly looking area is a labyrinth of mud holes, in which Grendel and his Grandmother live following the old English poems of Scandinavian origin, and treacherous channels that teach you that only the efforts of a detour lead you to your destination. Dina’s workplace will be around this iconographic blue Watchhouse. You are very welcome to visit her. She will be delighted leading you around showing you what the untrained eye doesn’t see. Don’t you think that this blue Watchhouse fits perfectly well into this landscape? Das blaue Haus wird Dinas neue Arbeitsstellen werden. Ihr könnt sie dort gerne besuchen kommen. Sie wird euch freudig herumführen und zeigen, was das unwissende Auge nicht sieht. Findet ihr nicht auch, das blaue Haus passt perfekt in diese Gegend? This nature reserve is exemplary looked after by the NT since it purchased this area in 1912. In 1954, the Blakeney Point was declared a Side of Special Scientific Interest (SSSI). The centre of the research is that blue Watchhouse. From there seal counts are organised and the behaviour of terns is studied as this is one of the most important sides in Europe for breeding terns. Dieses Naturschutzgebiet wird vom National Trust vorbildlich gepflegt, der 1912 dieses Gebiet erwarb, das 1954 zu einem geschützten Gebiet für wissenschaftliche Forschung erklärt wurde. Die Forschungen werden bis heute vom blauen Watchhouse aus geleitet. Da werden u.a. Seehunde untersucht und gezählt und das Verhalten von Seeschwalben studiert. Im Sommer ist nämlich der Blakeney Point eine der wichtigsten Brutstätten für Seeschwalben in Europa. Behind the little dunes left of the Watchhouse are the breeding grounds of the seals and terns. They live here harmoniously together. This area is a fenced off no-go area until late autumn that the seals and terns can breed and live here undisturbed. Hinter der Düne links vom Watchhouse befinden sich die Brutgebiete der Seehunde und Terns, die in harmonischer Zweisamkeit dort zusammen leben. Bis in den Herbst hinein sind diese Gebiete für Besucher abgesperrt, auf dass Seehunde und Seeschwalben ihre Ruhe haben. This entry was posted in Norfolk, England and tagged Blakeney Point, Lifeboat house, National Trust, North Norfolk, seal warden, Seals, terns, wildlife. Bookmark the permalink. This looks so amazing, it is easy to see why you love it there. What a wonderful thing to do become a warden for NT. Please let us know how it is, I find is so exciting, sure you will see more than ever after having the training. Be right in the middle of it and part of nature and wildlife. Enjoy every minute of it! Amazing pictures again, ready to walk along with you! we all four love the Blakeney Point. It will be even a greater wildlife experience with our dear Dina out there. Woaw! This is going to be another extraordinary adventure! Looking forward meeting you at the Point this winter and hear more of your discoveries. Dina is very much looking forward to working there. We are sure she will be happy meeting you at the Point. What a privilege and a delight to be engaged in such an undertaking. What better company can you want than roly poly seals (and the occasional Klaus, having his lunch 🙂 ). This morning I will be walking among the salt marshes at Fuseta, in the Algarve. I will keep my eyes peeled. we hope you had a great walk in your salt marshes at Fuseta. Maybe you meet some seals there. No seals, but lots of seabirds, and some lovely friends to walk with. And heaps of salt! 🙂 🙂 Wishing you a lovely week ahead. Awesome never knew so much about this marvelous place and such beautiful pictures of nature at its best and the little cute seals basking in the sand. Thanks for this wonderful share. Welcome and same to you too. Dina can’t way to start it at the end of this month. Indeed, Dina sees it as an honour and can’t wait to start. it’s really great out there, nature pure. Great images of a great area. Good luck, Dina in your new role. I hope you enjoy being a NT volunteer as much as I do. you are an NT volunteer as well. What’s your work and where do you work? I work at Fountains Abbey and Studley Roayal, near Ripon. You can find me there sometimes dressed as a monk, telling children about how it would have been to live like this. Or directing cars in the car park. Or enjoying the views from the Banqueting House, or, or ….. All good fun! Have a great, if chilly weekend. Your photos always capture the essence of our Norfolk coastline so well. And it is great news that Dina is going to be a Seal Warden. Imagine the photo opportunities! Hope to see you out there this winter, Pete. Nevertheless, I will change this – from now on I try to catch pictures of Dina photographing. It was always my idea to photograph people while they are taking pictures. I answered about Dina and taking photographs of her above. Well, our beloved Bookfayries … They are fairies and fairies can’t be banned into a picture. They are un-photographable. One can only draw or paint them. This is the only way to picture them. Our two little fairies worked some magic for Dina to get this job. here we are again. We are very proud to drive a high tech Volvo. But we can tell you, you really have to study to operate all these functions. It’s a Volvo XC40 and we love it. It was Dina’s love at the first glance. I, Klausbernd, always drove Volvo. The Volvo 164 was a great car, a beautiful design. A year ago the daughter of a Finish friend of ours in Cley married in Wiveton Church and the couple left in a beautifully restored white Volvo 164. Here we have horrible weather right now, nevertheless, we will try out our new car later. WOW, we are impressed: white car with red leather seats > GREAT! The colour of our car is called pine grey and Dina chose white leather seats. Does the Woad Centre in Beetley still exist? Dina and some friends from her photographer’s club would like to take pictures there. We had the feeling that it’s closed as well. What a pity. Enjoy the Sunday and the sun. We were out this summer. We took a boat tour, what a lovely spot it was to explore. How fabulous to get to volunteer there! YES, we think the next time you are around just give us a ring. We have a little boat and if the tide is right we can go out and say hello to the seals and terns. Oh nice, thanks very much! Liebe Dina, ich freue mich sehr für dich und deinen neuen Job. Ich habe mich schon länger gefragt, ob deine Arbeit in B. nun beendet ist, so ist es dann wohl! Ja, ein kleines bisschen neidisch kann man da schon werden, aber ich halte es dann lieber mit der Mitfreude und der Vorfreude auf deine Bilder. Die heutigen waren wieder zauberschön. Ja, liebe Ulli, das finde ich auch. Wo ich doch deine Gegend durch Graf Dürckheim und Joachim Ernst Behrend gut kenne, solltest du auch unsere kennenlernen. Es lohnt sich. Herzlichen Dank auch dir, lieber Klausbernd 🙂 ich freue mich sehr über eure Einladung und wenn ich die Bilder sehe möchte ich sofort meinen Koffer packen … Geduld! Ja, da wunderst du dich, aber den Morgen verbrachten wir unserem neuen hoch computerisierten Volvo und programmierten ihn auf Dinas und meine Bedürfnisse und Vorlieben. Aber gleich geht’s in die Natur, da auch jetzt, wie bestellt, die Sonne herauskommt. Auch dir einen wunderfeinen Sonntag. “…..Seehunde und Seeschwalben ihre Ruhe haben……” Jaaaaaaahhhhhh!!! Ja, die sind sich selbst genug! ja, ‘The Sea, The Sea’ (Iris Murdoch) hat schon etwas faszinierendes und speziell das wildlife dort. Es ist eine Schande, dass Iris Murdoch so stark unter Alzheimer litt, bevor sie starb. Kennst du diese Bücher. Sie liegen bei uns unter ‘zu lesende Werke’. Nein, diese Titel kenne ich noch nicht, aber ich werde sie mir merken, da Alzheimer ja immer mehr zu einem Thema wird! in unserem Dorf leben viele Alte und so gibt es hier einige, die Alzheimer bekommen haben. Wir finden das etwas gruselig. Das wussten wir gar nicht, dass Schwermetallemissionen eine Rolle bei der Alzheimer Erkrankung spielen. Danke für die Information. Uns scheint es, dass gerade geistig sehr aktive Menschen Alzheimer bekommen wie Iris Murdoch, Terry Pratchett, Aaron Copeland und einige der vormals führenden Politiker wie Magret Thatcher and Ronald Reagan. Hier scheint wunderschön die Sonne, es ist ein feiner Herbsttag. es tut mir so leid, hier vom Unfall Deines Mannes zu lesen. Ich halte die Daumen und wuensche ihm schnelle und volllstaendige Genesung. Wie schnell es gehen kann, das haben wir neulich auch erlebt, als Mary beim Heruntersteigen die letzte Stufe einer Leiter verpasst hat. Zum Glueck “nur” eine schwere Prellung, aber ganz sind die Folgen selbst nach mehr als 4 Wochen noch nicht vorbei. Ich hoffe, dass es eine Lehre sein kann für diejenigen, die dieses hier lesen! L.G. wir waren geschockt, das zu hören. Es tut uns SEHR leid, dass dein Mann solch einen schweren Unfall hatte. Wir wünschen baldige und vollkommene Genesung. Möge sich der Zustand deines Mannes schneller als erwartet bessern. gut, dass es die letzte Stufe war. Ich darf nur unter Aufsicht von Dina, Siri und Selma auf die Leiter, was ich regelmäßig muss, um die Dachrinnen zu säubern. Dieses Mal habe ich unseren Handyman die Dachrinnen saeubern lassen, aber in Zukunft mache ich das auch wieder selber. Mehr Sorgen mache ich mir, wenn ich mal – und bald istr das wieder noetig – auf unser Hausdach klettern muss. Vor Allem runter – vom Dach auf die Leiter – ist nicht ganz einfach. Danke fuer die guten Wunesche fuer Mary. Es ist fast komplett ueberstanden. mein Hausdach zu erklettern hätte ich großen Schiss. Gerade dieser Übergang von Leiter zu Dach > wicked! Vor 5 Jahren gestand ich mir ein, das nicht mehr machen zu wollen. Da gibt’s so einen Punkt, wenn ich den überschreite, werde ich unsicher. Ich vermute ein wenig, dass dies das Alter ist. Wenn ich mich erinnere, was ich bei meinem Trecking im Himalaya alles erklettern musste, um weiterzukommen, wird’s mir heute erst schwindelig. Damals ging’s easy. Ich kann mich nicht mehr so auf meinem Gleichgewichtssinn verlassen wie noch vor 10 oder gar 20 Jahren. Und bin ich nochmals gewarnt, dass ich nur ganz vorsichtig und bestens abgesichert Leitern auf- und absteige. Ich werde jetzt auch beim Treppensteigen im Haus mehr altersgemäße Anmut walten lassen. Aber sag ‘mal, musst du wirklich dieses Dach besteigen? Gibt’s da keine young lads bei euch, die das spielerisch für dich machen können. Echt, bleib auf der Erde, lieber Pit, wir sind doch keine Vögel! ob ich das Dach besteigen MUSS? Bestimmt nicht. Das koennen unsere beiden Handymen auch. Aber ueber Manches da oben, ueber den Zustand von Dach und Holz, da moechte ich mich schon selber informieren, mit dem eigenen Augenschein. Also wird es wohl gelegentlich doch wieder, wie hier [https://wp.me/p4uPk8-zJ] zu einem “Pit on the Hot (Tin) Roof” kommen. Uebrigens: ein Teil unseres Daches, ueber einem Teil der Terrasse, ist zwar nicht unbedingt “Tin”, aber doch Metall [Aluminium]. Was ich Dir gerne zugebe: mit zunehmendem Alter werde ich nicht nur vorsicthiger, sondern auch aengstlicher. Beides geht Hand in Hand. Mal sehen, wie lange es noch (gut) geht. Dina ist gerade mit einem Kollegen vom Fotoclub nach Sheringham gefahren. Dort ist die Parade alter Dampflocks heute und morgen. Das reizt ihr Fotografinnenherz. Wir werden dann morgen zusammen auf den unterschiedlichsten Dampflocks zwischen Holt und Sheringham, mit einem feinem Picknic bewaffnet, hin und her fahren. Wir wünschen dir und Mary ein wunderschönes Wochenende. After hearing year after year of the wasteful acts of seals being killed, I am not only thrilled to know they have a safe place to live and breed – but I KNOW one of the wardens – how cool is that, Dina?!!! I am should have known one of you would help these wonderful creatures. Klausbernd, you look awfully comfortable at the Blue House – enjoying all that peace and quiet, eh? Bookfayries, you must be extremely proud of your Mistress, Dina. I know I sure am! especially our beloved Bookfaries think it’s VERY cool Dina being a seal warden. The outer Blakeney Point is a seal sanctuary. We have so many seals breeding there that some of them getting exported to weak colonies all over the North Sea. Siri 🙂 and 🙂 Selma are so proud of our dear Dina and our happy Master as well. He loves going out there and enjoys his sandwiches at the blue Watchhouse watching seals and terns. Looks gorgeous, and the photo’s are lovely. Thank you very much for liking our post. Wonderful photos and great information. Do the seals remain there even during cold winters? Yes, the seals are there all the year around. They have their pups in the wintertime. It doesn’t get really cold here during the winter months, f.e. we rarely have severe frosts at our coast. Indeed, it’s an amazing place out there. We always have the feeling of being in an enchanted world. prima, dass dir Dina’s Fotos gefallen und da werden sicher noch mehr kommen. Da wollten wir auch schon seit längerem hin. Es muss eine sehr besondere Landschaft sein – aber es ist leider ziemlich weit entfernt von uns. Naja, wir bekamen gestern ein neues Auto, das gefahren werden möchte. Und den Osten Deutschlands, außer Eisenhüttenstadt, wo wir Freunde haben, kennen wir überhaupt nicht. Lebst du dort in der Nähe des Elbsandsteingebirges? Mein Expeditionsleiter für NO Grönland und die Hoch-Arktis lebt auch in Dresden. Der Gründe gibt es viele, in der Tat. Meistens fahren wir in den Norden, aber der Osten wäre ja auch ‘mal eine Option. Viel, viel weiter Osten kenne ich besser. Ich war ständig in Petersburg, Moskau und Nowgorod in Zeiten der UdSSR, wurde aber später für eine Expedition nach NO Sibirien abgelehnt (du glaubst es kaum, wegen Untergewichts). 😁 Du bist ja viel rumgekommen. Dann schaffst du bzw. ihr es sicher auch mal in die östlichen Gefilde von Deutschland. Du wirst es kaum glauben, ich bin fast überall in der Welt gewesen außer in Australien und im Osten Deutschlands. Da wollten wir schon immer ‘mal hin 🙂 Aber wir kommen fast nie nach Deutschland. Vielleicht sollten wir das ändern. Ich lebte kürzer in Deutschland als in anderen Ländern. Die Sprache und Kultur sind unsere Verbindungen zu Deutschland. Die Orte kommen jetzt ganz oben auf unsere Liste wo Plätzen, die wir besuchen wollen. Wir lieben auch die Ostsee, an ihren schönen Sränden wohnten wir früher in Finland und Schweden. Wonderful photos and a wonderful opportunity for Dina to be closer to her friends, the seals. Will Siri and Selma work with her sometimes? I am sure Dina would like some assistants, especially when she is taking photographs. Siri 🙂 and 🙂 Selma will help Dina, Selma with getting Dina’s gear in place and Siri with counting the seals and their pups. Siri 🙂 and 🙂 Selma are as excited about Dina’s new job as Dina herself. I am with the other 100 or so who Commented ahead of me. A world heretofore unknown to me! Thanks for aiding my ever expanding world . . . .
you are interested in butterflies and at the Blakeney Point, you find rare butterflies sometimes. They are blown over the sea. But the place is special for being the breeding ground of seals and terns. When we came here it was a world unknown to us as well. We came from big cities but we can’t imagine living in a city any more. Go, Dina, go! What a fabulous place! And that blue Watchhouse is utterly perfect. Looking forward to more pictures. we are sure that more pictures will come from this otherworldly place. The blue Watchhouse is iconic, isn’t it? We love it. Yay! Looking forward to them. What a joy that must be! Even though I love our mountains here in British Columbia, I must admit the wide open spaces as portrayed bz Dina exert a special attraction for me. Your walk on the 7 km (?) sand spit although strenuous was rewarding. Congratulations to Dina on her upcoming job to study the seals! our dear Dina will become a seal specialist and, of course, we’ll help her. 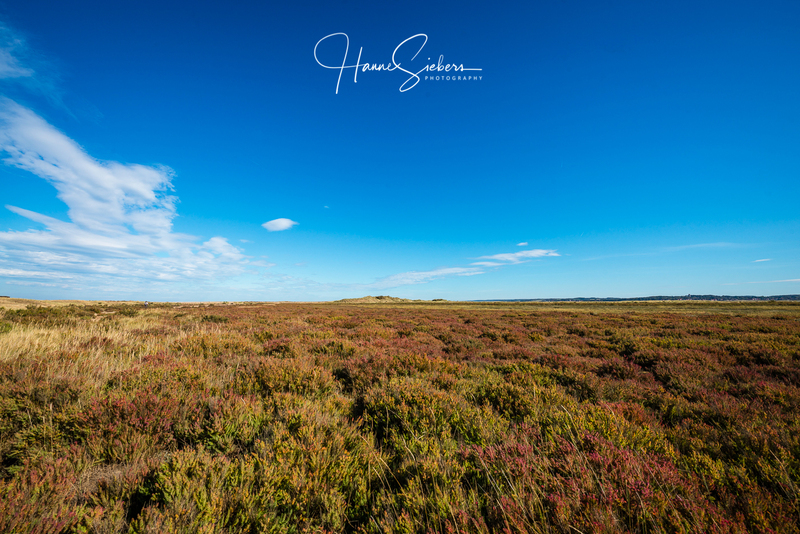 These wide open deserted spaces full of wildlife are the attraction of the Blakeney Point. To walk there is quite a job but so rewarding! We can see the attraction of the mountains as well, but we have hardly any experience with hiking or living in the mountains. what Siri 🙂 and 🙂 Selma wrote above is not true. In my youth, I did the Trans-Himalaya treck from Ladakh to Sikkim, which took more than half a year, it was breathtaking. People who grew up in the Prairie provinces with its huge open spaces do not like the mountains. They feel claustrophobic and do not like our winding mountain roads. But my wife and I live it here. Greetings to you four. Sri and Selma made a mistake, but it’s no big deal. actually we love driving winding mountain roads. We like the mountain tops but get an uncomfortable feeling in the valleys. Actually, we prefer the wide horizons of the seaside. 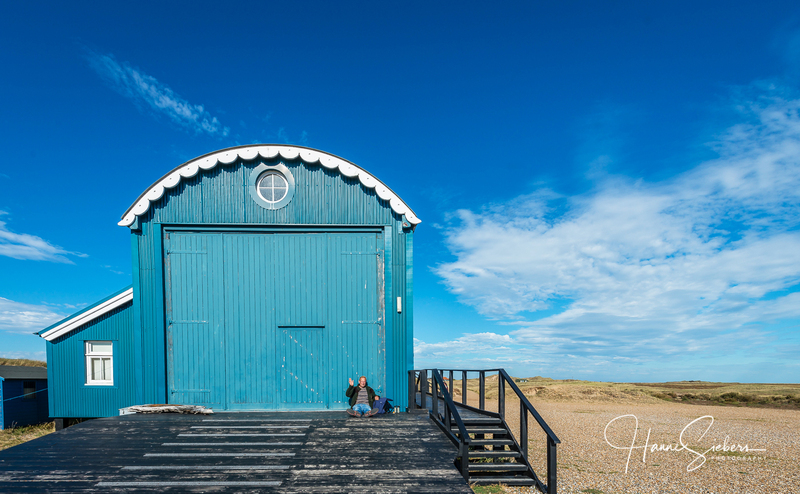 The blue Watchhouse is so beautiful in that environment and especially against that blue sky! Wow! What an experience being a warden there will be. Exciting time ahead Dina. And I am sure the Bookfayries will be hitching a ride in the jeep! Hope you get a few minutes to capture some photos for us in the months ahead. the weather is cold, windy and overcast here. The best place to be is in our cosy Bookfayrie home. Siri 🙂 and 🙂 Selma will surely hitch a ride and help Dina with looking after the seals and especially their pups. Their help will give Dina time to take photographs – at least, we all hope so. Extremely windy here too KB. Wasn’t expecting that! Rained for about 5 hours in the early hours, but a lovely sunny day now. Too blowy to get outside and plant all my bulbs though. We are sitting in front of the open fire. It’s quite cosy. Sunny weather is forecasted for tomorrow. Fantastic! A marvelous collection of excellent photos that tell a story. Great that you like Dina’s photography! The big open skies would be awesome to wake up to each morning. I imagine you enjoying morning tea all bundled warm as you look forward to a day of fresh air and possibilities. You have a beautiful spot of mother nature to enjoy for the autumn. We love the big skies and open spaces here, the clear air and, of course, the never tired sea pushing against the beaches. Fortunately, our dear Dina gets an outdoor outfit from the National Trust looking like a real ranger be outside in every weather. Dina ist bereits sehr aufgeregt und da hast du wohl recht, Arbeit in Anführungsstrichen zu schreiben. solche Wortschoepfungen, mit den Sternchen davor und dahinter, stammen aus der Fruehzeit der Chats, glaube ich, ebenso wir Abkuerzungen wie “4u” fuer “for you”. wir kennen diese Art Kurzschrift auch von Nummernschildern bei Autos wie z.B. ‘2fast4u’. Hier ist es erheblich kälter. Meistens bleibt die Temperatur unter 20 Grad C und in der Nacht gibt es einstellige Grade. Aber dennoch haben wir wunderschönes Herbstwetter mit viel Sonne und wenig Wind. Ob/Wann wir ein neues Auto bekommen, das wissen wir noch nicht. Wir haben schon mal drueber nachgedacht, aber sind noch zu keinem Ergebnis gekommen. Mit Meilenstand 78.000 brauchen wir ja noch nicht unbedingt an Ersatz zu denken. Bis so etwa 120.000 sollte der Escape ohne Probleme but sein, und das sind bei unserer Fahrleistung noch ca. 3 Jahre. Und ob wir dann ein komplett neues Auto kaufen solllen, oder wieder ein gebrauchtes [das dann ja auch locker wieder fuer 6 Jahre seinen Dienst tun wuerde], das steht in den Sternen. Schliesslich werden wir ja nicht juenger und wissen nicht, wie lange wir ueberhaupt noch fahren koennen. So ist es dann wirklich eine Ueberlegung wert, uns bald einen ganz neuen Wagen zuzulegen. Mary wuerde unheimlich gerne einmal wieder einen Pick-Up Truck haben, und ich waere dem auch nicht ebgeneigt. wow, was haben wir für einen schönen Herbst! Gleich werden wir wieder ein Ausflug machen. Gestern waren wir in den Norfolk Broads, es war wunderschön. Klar doch, man kann unseren Volvo auch ganz normal fahren. Diese Funktionen, über die ich schrieb, kann man ein- oder ausschalten. Ich fahre jedoch mit automatischen Bremsen und Abstandhaltung, mit Verkehrsschild einlesen (was mich z.B. nicht über die Geschwindigkeitsbegrenzung fahren lässt, was ich sehr bequem finde – no more speeding 😉 ) und dass ich in in meiner Spur gehalten werde. All dies finde ich sehr bequem. Aber wie gesagt, man kann auch ohne das alles fahen. Ich war dafür, unseren Volvo mit nur 80.000 km und 12 Jahre alt zu verkaufen, da er einmal noch einiges Geld brachte als Gebrauchtwagen und ich befürchte, dass Reperaturen, die bei Volvo stets teuer sind, anfallen würden. Dazu kommt, dass es immer mehr Dieselfahrverbote gibt, so dass wir jetzt einen Benziner haben. Außerdem denken Hanne-Dina und ich, dass dies das letzte Auto ist, das wir fahren werden. Wir rechnen damit, dass dieser Volvo problemlos mind. 12 Jahre hält wie der Vorgänger. Dann bin ich 84, naja, ob ich dann noch fahren werde? Wenn ich die Entwicklung in der Autoelektronik sehe, dann glaube ich, dass in 12 Jahren sicherlich die Autos weitgehend selbst fahren werden und dass die Motoren schon aus Umwetschutzgründen anders aussehen werden als heute. Einen Pick-Up finde ich voll schick. Unser Gärtner fährt einen großen Ford-Pick-Up mit Doppelkabine. Die sind ja echt praktisch. Aber der Treibstoffverbrauch ist haarsträubend im Vergleich z.B. mit unserem neuen SUV, obwohl der kontinuierlich mit Allrad-Drive fährt. Bei Peters Pick-Up kann man 4wheel drive ein- und ausschalten. Wir genießen unser neues Auto sehr. Ich muss ja kichern, dieser Car-Talk findet auf unserer Post quasi zum Naturschutz statt. Aber der Realität scheint das Widersprüchliche wesenhaft zu sein – oder? – meine Google Navigationsapp zeigt, im Gegensatz zu TomTom, das ich frueher benutzt habe, nicht an, welche Begrenzung auf der gerade befahrenen Strasse herrscht. Was den Neukauf eines Wagens angeht, da haben wir die gleichen Gedanken: ein Neuer [bei uns eben vielleicht ein Gebrauchter] sollte her, bevor die (grossen) Reparaturen anfangen. Und wir fragen uns auch immer wieder, wie lange wir noch werden fahren koennen. Deswegen auch mein Gedanke: wenn schon ein Neuwagen, dann bald. Dass ein Pick-Up ein “Gas Guzzler” ist – immer noch ist, trotz aller Fortschritte in der Motorentechnik – das ist klar. Ich war aber erstaunt, wie wenig – auf die Wagengroesse bezogen – die modernen Fordmotoren brauche. Ein “dicker” Pick-Up wuerde nicht mehr schlucken als unser kleiner SUV jetzt. Und fuer unsere Zwecke waere eine offene Ladeflaeche optimal, damit ich nicht so oft mit Anhaenger fahren muss. Eine Doppelkabine muesste es allerdings ein, damit auch mal jemand mitfahren kann. Das war der Riesennachteil beim Mtarys altem Pick-Up: nur auf ganz kurzen Strecken konnte (wenigstens) eine Person mitfahren, aber schon der hat man mit dem Schalthebel zwischen den Beinen herumgeruehrt. Und wenn wir einmal zu vier unterwegs sein wollte/mussten, dann mussten wir uns einen Wagen leihen. Aeusserst unpraktisch. Und apropos “cat talk auf einem Beitrag zum Naturschutz”: der Mensch ist eben widerspruechlich! Dennoch: wir machen, hoffentlich, in kleinen Breichen doch unseren Beitrag. P.S. : Alleine schon unsere Konversation hier kostet ja Energie, die irgendwie produziert werden muss, und ist dann als solche auch nicht gerade umweltfreundlich. eine große offene Ladefläche finden wir auch ideal. Aber wenn wir, was wir meistens machen, ohne irgendwelche Ladungen fahren, ist doch eine Limusine viel bequemer. Wir haben nun auch eine Anhängerkupplung für unseren Bootsanhänger. Da müssen wir jedoch noch erst lernen, mit Hänger zu fahren, was ja nicht ganz so leicht ist. Der Verbrauch bei den neuen Motoren ist super. Unser SUV braucht so zwischen 5 und 6 ltr. pro 100 km, wenn ich Eco einstelle. Außerdem fährt er dann extrem smooth. A pro pos SatNav, wir hatten bislang einen Garmin, mit dem wir sehr zufrieden waren. Zumindest in ganz Europa ist er zuverlässig und gibt auch im Falle von Umleitungen, Staus etc. stets eine Umfahrt an und zeigt, wie viel Minuten diese benötigt. Er warnte uns mit einem akkustischen Signal, wenn wir die Geschwindigkeitsbegrenzung überschreiten. Das Volvo SatNav lässt mich einfach, bei entsprechender Einstellung, gar nicht schneller fahren. Da hast du wohl Recht. Als ich es mir überlegte, kam ich zu dem Schluss, dass jegliche Kommunikation Energie verbraucht. Selbst wenn man von Angesicht zu Angesicht kommuniziert, muss man meistens den Kommunikationspartner treffen, was wieder Energie verbraucht. Einzig die Kommunikation im familiären Rahmen ist resourcenfreundlich. Fabulous! These wonderful photos of the seascape and seals make me long to be there. I hope the winter months will be safe for seals and wardens! actually, we don’t have real winters here, it’s a mild sea climate without real frost and unfortunately hardly any snow. The winter is an important time for the seals because they are having their pups then. The gales are the danger especially in autumn with big floods. The pups can get washed up far away from their mothers. Then Dina will help them getting united with their mothers again. I hope the pups will not be separated from their mothers, but if it happens, I am glad that Dina will be there to bring everybody back together again! the pups need some time for growing a kind of fur that helps them to swim. Female grey seals are dedicated parents, spending several weeks feeding their pups. The pups drink about two and a half litres of milk every day and it’s so rich pups can grow by as much as 30kg in two weeks. After a month or so, females leave their pups and head back out to sea where they feed and mate again. The pups can spend up to two weeks all alone on the beach while they build up the courage and the right fur to go into the sea and learn to fish for themselves. Dina will look after the pups that they don’t get seperated from their mother too early. By the way, we absolutely love your squirrel-talk 🙂 GREAT. Do you know that our beloved Bookfayries can speak and understand squirrelese? I appreciate the detailed description about the seals and their pups. Animal parents are extremely dedicated in so many cases, it is very touching. I am impressed, but, alas, there is no hope for me, as I have sworn off animal meat! Warm greetings across the pond to you. Have a lovely Sunday! And you have a good week. Congratulations to Dina for her upcoming certification as a seal warden. I can see your attraction to this spot—I am reminded of the beaches in Pt Reyes here in California. We had already our first autumn storms. Fortunately, no harm was done. Well, we are used to those storms. It’s different when seals are having pups. The pups can’t cope with a rough sea and big waves. That’s one reason having wardens out there to help them come back to their tribe when washed on land too far away. Unfortunately, we don’t know California that well. But we can well imagine rather similar areas at your coast. We will make sure to be cautious during the winter storms, Klaus. Thank you. Actually, we find it quite cosy sitting inside in front of a roaring fire when outside a storm is howling. Fortunately, we have noch bigger trees near our house. That scenario is hard to beat. Thanks, Klaus, and stay dry. We have been to some beaches of Northumberland several times. We love it there as well. Here the climate is quite much milder. The blue Watchhouse is great, isn’t it? It fits that well into this nature out at the Point. pssst, don’t tell anybody else! Siri 🙂 and 🙂 Selma know the Selkie-language and not only this, they are able to call the Selkies and swim with them during hot summers. Dina had to promise never ever to take photographs of a Selkie otherwise she will be turned into one too. If Selkies don’t keep their privacy they will suffer, as old tales tell us. This kind of blue makes me feel so happy. Great pictures! We love this blue too! The sky is lovely as well. Excellent pictures. The Blue color of the watchhouse is very unusual. One would expect a more utilitarian color. there were aesthetical reasons for this colour. It had to fit into this landscape. And so it became an iconic building loved by everybody here. Dina will surely have more stories to tell from her new job than we are able to publish. Well, there have to be secrets as well. Hi K, Dina’s photography is a pleasure to behold. I am looking forward to stories from her new profile. It sounds straight out of the documentaries we watch on the Outer Hebrides! It’s funny, we have been on the Outer Hebrides about a year ago. We found great beaches there, similar to ours here. I am sure Dina will be full of stories coming back from her work and she’ll bring back great photgraphs as well. You are blessed. The Outer Hebrides are charmed. My husband and I have plans of someday spending time hopping around the isles there. You all have a great weekend. Cheers. We can very much recommend this. We enjoyed this island hopping really much. thank you so much for liking Dina’s photos. We are sure that there will come more. We all three will help Dina, of course! We all love to be out there and helping Dina with the seals and her photography. It is a beautiful part of England, but England has many most beautiful areas we are now visiting one after the other with our new car. Lovely post, thanks very much. These National Nature Reserves are so important in preserving and nurturing our precious wildlife. I visited Westhay NNR in Somerset today and was blown away by the beauty and creativeness of the place, designed to allow all ages to learn to love and respect nature. I had the wonderful experience of seeing an osprey for the first time, a freshly caught fish in his powerful claws. Westhay has provided a safe stop-off point for these beautiful birds as they migrate to Africa. Long live NNR like Blakeney and Westhay and we should all campaign for more of them to be established. we absolutely agree with you! These NNRs are extremely important for our wildlife and the NT, NWT and all those other organisations keeping up places for wildlife do an important job. Therefore we support them and campaign for them. The whole coast of North Norfolk is an Area of Outstanding Natural Beauty, an NNR and place of special scientific interest. Many people living here have chosen this area for its wildlife, especially birds. Bless your heart, Diana, for taking on this new job, it will be very rewarding for you and the environment . Hanne is very happy that she got accepted for this job and she is very excited already to start at the end of this month. Love. What a gorgeous, fortunate area this is– and how lovely for you folks! I enjoyed these atmospheric photos, thanks! we know that we are privileged to live in this AONB (Area of Outstanding Natural Beauty) and we try to keep it as a kind of paradise and a sanctuary for wildlife. Lucky Dina! Those photos are stunning. Hattest du eine tolle Ernte? Hier war’s zu trocken und heiß. Wildlife conservation is so important! Glad to see that Dina has taken on this job, this must be right dow her lane. Somehow I have the impression, the Wildlife Organisations in the UK are doing a much better job than many other countries, not only protecting wild plant and animal species and their habitat, but also securing the coast. So much of the Swedish coast is in private hands and not open to public. Wildlife plays an important role in balancing the ecosystem and I deeply approve of this engagement. How is the new car, did everything go well yesterday? you are right, wildlife conservation is that important. Well, without wildlife humans will die out as well. In contrast to Sweden, the whole coastline between highest and lowest water belongs to the Queen who gives free access to it. Therefore it’s open to the public. And then there is the NT and NWT who owns a lot of coastlines here and does important conservation work. We are so happy about our new Volvo 🙂 🙂 🙂 🙂 We got neatly 2 hours introduction into its technology but we suppose getting into all the tricks of driving such a kind futuristic car will come by doing it. Großartig! Gratuliere zu dieser Aufgabe, Hanne! Wir freuen uns auf die bebilderten Berichte. Jetzt um diese Zeit kam ich ja stets zu euch zur Buchmesse, daran musste ich gerade denken und an eure so liebe Gastfreundschaft. Ihr müsst auch ‘mal hier vorbeikommen. Ich bin begeistert!! Vom blauen Haus, Dinas tollem Job, den Seehunden, die ich so sehr liebe. Wie ein kleines Kind klatsch ich in die Hände und freue mich unbändig auf die Fotos in spe, die uns alle hier erwarten. Ich war heute auch ganz kurz am Meer…viel zu kurz. Ich liebs so sehr und so kommt es wie gerufen, dass ich hier eure tollen Fotos sehen kann. Danke! Ganz liebe Grüße an the Fab Four of Cley. Unser liebes Dinalein ist ja auch schon völlig aufgeregt und kann es kaum erwarten, dass ihr neuer Job beginnt. Wie wir sie kennen, wird sie sicher viele tolle Fotos dort draußen machen. Da kannst du schon gespannt sein. And if the seals first know who awaits them with dear Dina, they will probably be the most excited of us all 😀 ❤ Sonnige Grüße. Das ist so umwerfend schön! Und interessant! Und das blaue Haus ist schlicht und ergreifend hinreissend! Schön, dass dir unsere Gegend und Dinas Fotos so gut gefallen. Das blaue Watchhouse passt perfekt in diese Gegend, das finden wir auch. wir sind auch immer wieder begeistert über all die niedlichen Seehunde und die elegant fliegenden Seeschwalben mit ihrem schrillen Geschrei. Schweden ist doch auch wunderschön. Dort gibt es doch auch noch viel umberührte Natur. Wir hatten einst ein Sommerhaus auf Öland bevor die Brücke gebaut wurde und wohnten auch einige Zeit in Småland, wo uns die endlosen Wälder und verwunschenen Seen faszinierten. Beautiful, beautiful! And Dina, you are one lucky woman! Dina is so happy 🙂 She can’t wait to start her job. Wish you all the best for the week as well! We are having what we call “Brittsommar”. This warm, soft weather with high temperatures and sun in October. It always comes, if it comes, with the “Birgitta-day”. We just saw that the weather in Sweden and Norway is warmer than it is here. Nevertheless, we have a sunny autumn weather but rather cool. Is the Birgitta-day named after the medieval mystic Birgitta Birgersdotter? Yes, since the Middle Ages that day is named after her. This past week, Simon Fraser University had its Fall Convocation ceremonies. Jane Goodall received a honoury degree from SFU. Jane Goodal’s speech to the graduating class was a call to action, a reminder that everything we do makes a difference. Our world is in grave peril, but by working together, there is hope. This post was a wonderful affirmation of her words. Much love and many, many hugs to my dear friends, the Fab Four of Cley. what Jane Goodall did for the chimpanzees we do here for the seals. She is so right, everything we do makes a difference. It’s very important to raise the awareness. That is actually what all spiritual teachers always emphasized. Thank you again for your marvelous and generous posts. Today in Canada, we are celebrating Thanksgiving. I am thankful that we have connected with the Fab Four of Cley. Many hugs and love coming back your way on wings of speed. indeed, our seals look a bit like dogs when they are swimming with their heads above the water. Sorry, not like you but like other dogs. Do you like fish like the seals? I really need more “walking along the shore enraptured by nature” in my life. I suppose that means I need my own California-based Dina and Siri. Sigh. shall we send Siri and Selma over to you? – but for a short visit only! For us, it’s relatively easy as we live in the middle of this shoreline and we have enough time to enjoy it. If the weather is nice we just walk along the beach. And the weather is nice here quite often (maybe too often 😉 ). What a beautiful, pristine coastline! I hope it will remain a paradise for birds and seals, relatively undisturbed by human activity. we very much hope so too. Fortunately, there are many wildlife organisations which do a lot of good work. Ecology is a big topic here. On the other hand, the EU pays quite a lot to keep our area ecologically sound. Nobody really knows what will happen after Brexit. I loved this post – beautiful photos! They. ring back memories. When I was a child the old lifehouse sold cups of tea and kitkats and that was about all. There were no seal tourists then, just a couple of keen birdwatchers. We loved seeing the seals – good luck to Dina with her job as seal warden! we can remember these times as well but unfortunately, they are long gone. Now there are seal trips from Morston but fortunately, there is only tourism out there at high tide when the boats can go. Not many people walk out there because a return trip takes about 6 hours with a short break for a picnic in the dunes. You may meet there the odd keen birdwatcher but usually, you are the only one out there – except during the holiday season in July and August. Thanks a lot for wishing Dina good luck. What a lovely place. It has been too long since we were last out on Blakeney Point. We are ourselves just returned from Scotland where we experienced quite similar landscapes in East Lothian along the Firth of Forth. All the best form Norwich. Laurence and Jackie. we just came back from a trip to the Broads with our new car. It was so lovely. Such a nice weather. Your mail reminded me of the time when I was a young lad. I was sent to a so-called aunt in South Queensferry for 3 months to improve my English. Her 3 sons showed me around in East Lothian. We have to have our car checked at Volvo in Norwich after 3 months driving. It would be nice to meet in Norwich then. Also, der KB sitzt in perfekter 1. Position vor dem blauen Haus, freundlich die grüßende Hand hebend, mit Proviant, Stullen?, Tea?.. Da wird Dina sitzen und beobachten, wer hier angeschwommen, angeflogen, angerudert, angelaufen, gekrabbelt, gekrochen, dynamisch angefedert…was auch immer, kommt. Nur sie wird priviligiert sein, mit dem Landrover gechillt über die Steine fahren. Und dort, wieso heißt denn der Ort so komisch?, wird sie dann beobachten, meditieren, fotografieren, beschützen, was noch? Und wenn dann merkwürdige Dinge, Wesen, Szähnen, what ever, erscheinen…ja dann, wird sie gründlich reinigen, prüfen, was von all dem sie nutzen, leben, weiter verfolgen wird. Denn es wird nicht alles Sinn machen…jedenfalls ergab das meine Recherche. Nur mich, aus gegebenem Anlass. Ich bin jetzt stolze Besitzerin von Zahnreinigungsbürsten, für die Backenzähne, braucht man in verschiedenen Größen, da die Backenzähne eingefaltet sind und Zahnseide gar nichts nützt, wusstet ihr das? Die neusten Erkenntnisse sind nicht aufzuhalten!!! oder auch mal die Füße ins Meer und Tönen…man muss echt nicht die Stimmbänder drangsalieren…. Am Blakeney Point werden hauptsächlich biologische und ein wenig klimatologische Forschungen betrieben. Tote Seehunde am Strand werden z.B. markiert, dann abgeschleppt und seziert, um herauszufinen, woran sie starben. Das hat sich sehr bewährt, denn unsere Seehundkolonie wächst so stark, dass von ihr Seehunde in schwächere Seehundkolonien ‘importiert’ werden. Nun scheint wunderschön die Sonne und wir werden uns der Natur zeigen. wir, die liebklugen Buchfeen Siri 🙂 und 🙂 Selma, haben nachgeforscht, was es mit dem Namen ‘Blakeney’ auf sich hat. Im Doomsday Book (1086) wird Blakeney als ‘Snitterly’ aufgeführt. Der Name ‘Blakeney’ geht auf das Alt-Englische ‘blæk’ zurück, das ein im Wald gerodetes Gebiet bezeichnet oder ein Gebiet, das von einer Hecke umgeben ist. Es ist eine Markungsbezeichnung. die schnell ins Office gehuscht sind, um dir auf Masterchens Notebook das zu schreiben, ehe wir nun in den Garten flattern, um Äpfel für die liebe Dina aufzusammeln, da sie heute Abend Apfelpfannkuchen essen möchte – und wir auch! Es gibt ja sooooo viel zu lernen!! Freue mich so dolle auf die Fotos und Berichte aus dem dem blauen Schuppen! nun kommt der Herbst hier langsam an. Die gemütliche Zeit beginnt mit Hocken vorm offenen Feuer, wenn der Wind an den Hausecken heult. Wenn tote Seehunde länger am Strand liegen, wirden ihr Fleisch natürlich abgenagt und sie stinken gen Himmel. Bei Walen ist es noch schlimmer. Man kann sich ihnen nur im Lee nähern. Die Walfänger müssen ja einiges an Gestank ausgehalten haben. the seals and Dina are very excited 😉 She will start in a fortnight. Die Fotografie kann wirklich “groß” sein, das zeigen die Bilder – und der Mensch dagegen klein. Schönes Sinnbild daher! Hier soll’s demnächst endlich ‘mal regnen. Wonderful captures of this beautiful place Fab Four! What a terrific adventure awaits you Dina. It does look like it could get very cold and windy during winter – does it? actually, we love cold weather, but unfortunately, it never gets cold here. In the rare event, the temperature reaches -5 C people call that cold here. We rarely have frost and at this outpoint surrounded by the sea it’s even milder but quite breezy. Dina got equipped with a real ranger outfit you could survive a night in Greenland in it. So we have no worries about Dina being out there. We Bookfayries are not allowed to visit her out there because it’s too breezy and Dina and our Master are afraid that we get blown away. What a gorgeous spot! I’m excited for Dina and her new adventure. Tina asks a good question–how cold does it get in winter? I hope Dina has a nice warm coat and gloves! it’s a pity it never gets cold here. Therefore we were in search of snow and frost in Norway last winter. We need it cold with lots of snow and ice in winter. That’s fun, isn’t it? But unfortunately, we live in the wrong place for real winters. We have a typical sea climate here with warm winters. But the rest of the seasons are really great. So we go up North in wintertime. And our dear Dina is really well equipped, like for an Arctic expedition. We were amazed seeing her sweaters, gloves, hoods etc. We are afraid she gets too hot out there. As I wrote above: It never gets cold there. But, well, minus 5 C is called cold by the folks living here. For us, it starts under minus 15 C. We love this absolutely clear air and the optics when it’s cold. As there is no water in the air you see much clearer, sometimes prismatic colours in the air, several suns and other chimaeras. But all this you can’t experience here except the reflection of northern lights. I suspect that some of the locals will dispute your idea of “cold! !” When we lived in New Hampshire it was routinely -26 C. I am like Dina….wearing plenty of sweaters, a thick coat, boots…. Unlike her, I’m always cold! we are used to low temperatures and we are well equipped as we accompanied our dear Master on his Arctic expeditions. Minus 26 makes the world look different, doesn’t it? The lowest temperature we experienced was around minus 40. Even for us, that was cold. For the locals every temperature under plus 5 is cold. A light frost makes them stay inside. The Vicar led such a fascinating life, I do know that, with frequent stays in London to assist young ladies fallen on hard times… But I’d forgotten how he came to meet his Maker! Dina is thanking you very much for your great idea 🙂 🙂 Well, Seal Warden is cool as the occupation! She knows that she can’t compete with our famous Vicar of Stiffkey. But Siri 🙂 and 🙂 Selma are very happy that she isn’t in danger of getting headless like this vicar. We are very happy that we could trigger happy memories. When we go out on our small boat we always pass by this big seal colony at the Outer Point. We did that many times and it’s still magic, the seals and the terns with their high pitched cry. We love it! I suppose, when you look at your pictures you’ll notice that nothing has changed out there. but unfortunately in German only. To cut a long story short: The Vicar from Stiffkey invited these women of pleasure to his vicarage at Stiffkey. The locals loved it but he got sacked by the Church of England. Our vicar was highly creative. He became a famous circus attraction as a lion tamer (or was it tigers?). First, he became a local hero than an international celebrity. At the height of his career, he not only worked together with a 16-year-old girl. It is said, that she trod on the lion’s tale at the most exciting part of his show. He told the story of Daniel in the lions’ den holding his head in the mouth of the lion. The lion made him headless and the locals made him a nice grave in the churchyard. It’s still there. The Pub sign of The Red Lion shows the vicar, the girl and the lion. I love the vast beaches of Cley, Wells and Holkham! Walking on them calms my soul and makes me very happy. The beautiful photographs bring back so many wonderful memories of running and running on them as a girl! How exciting being a seal warden with a Land Rover too! walking these long and wide beaches calms us as well. We love it! Did you collect carnelians when you have been here? Siri 🙂 and 🙂 Selma love collecting carnelians and sometimes they even find a piece of jet. Dina and our Master like to look out for round stones. Yes, I have found carnelians on the beach but not recently. I love collecting shells too. Beautiful landscape. Precious seals. I am so envious of Dina, and I wish her all the best this winter as a seal warden. Dina is already quite excited. Her job starts at the end of this month. Such beautiful land — and sea — and such evocative photos. I can’t think of a better occupation than seal warden, particularly since imprisonment isn’t part of the deal. (Unless, of course, we consider the possibility of being imprisoned ourselves by the beauty of the land and the wholly captivating nature of the seals!) And didn’t I love finding this phrase in your description: “only the efforts of a detour lead you to your destination.” It’s true as can be, and another way of pointing to the value of serendipity. The effords of a detour lead to your destination is what Per Gynt in Ibsen’s drama has to learn. It’s so true, isn’t it? Actually, this seal warden job is the opposite to imprisonment, it’s the experience of vast open spaces. What a great place to spend the winter. I am sure it’s going to be tough at times, but also something beautifully different than anything else. Gotta love that blue watchhouse. we are sure that it will tough when the cold northern winds are blowing but it will be great as well. It’s an adventure and an adventure that makes sense. The blue watchhouse is the iconic point on our coast. The National Trust keeps it immaculate. Dina will wear her woollen cap out there too, we suppose. Delightful! The seals look kindly at you as I’m sure they know the graciousness of your hearts. thank you so much for your kind words. Yeah, we love the seals! And do you know what? Now the pupping starts and it will last to the beginning of January. The first seal gave birth a couple of days ago. How wonderful Klaus! I hope the pups learn to swim well in strength and longevity with mother sea. the pups have to feed on the very fat milk of their mothers before they grow a fur with which they can swim. Then they eat about 5 kg. fish per day. Therefore the fishermen didn’t like the seals and tried to kill as many as possible before they were protected. Indeed, out there at the Blakeney Point, it can get quite cold, especially with the wind chill. But Dina got quite a good thermo-outfit. Wearing it she looks like a Polar explorer. We suppose you are living in a warmer climate than we do. We have a maritime climate here that means it’s quite mild at our coast especially during the winter months. We miss the frost and snow we were used to in Norway and the Arctic. I didn’t realise we had seals in England, great pictures, if I’m ever in Norfolk I’d love to visit. especially the Norfolk coast is quite beautiful. The North Norfolk coast, the area where we live, is an Area of Outstanding Natural Beauty (AONB) and worth visiting. Cley next the Sea at this coast is a famous area for birdwatching. It’s calles “the Mecca of Birdwatching”. in our area, we have big seal colonies, Atlantic and common seals. Last year about 1250 seals were born at the Blakeney Point. I saw Jill today, with her Newfoundland dog, Rocky. She said that she met you at the bird-watching course. I was so pleased that you asked if she knew me.